2736Partners [Properties] Socially responsible architecture. This eco friendly East Austin home was designed by acclaimed architect Coleman Coker, who is well known for his intelligent and innovative designs. This contemporary home reinterprets the “Shotgun” vernacular with a modern aesthetic, and yet a very neighbor friendly design which respects the scale of the Masonfield neighborhood. There is an abundance of natural light in the public space, a pleasantly tall place with an open floor plan consisting of the living, dining and kitchen areas. The living area opens to a large deck, which has a sloping privacy wall for intimate gatherings. There are two bedrooms, and two bathrooms. The master bedroom has a screened porch which overlooks a lush wooded slope. The second bedroom, or flex room, is a very livable light filled space for work, or relaxation. The green features of this home include bamboo flooring, no and low VOC paints, energy star appliances, low-e windows, 15 SEER HVAC system, rainwater catchment system, and a drought tolerant landscape. 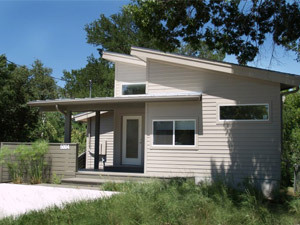 Designed by CF Architecture, this home was awarded Austin Energy’s highest green rating, five stars, in April 2008. This architecturally innovative home mixes a modern aesthetic with green building technology, and features generous amounts of natural light, and pleasantly tall interior spaces. There is an open public space consisting of dramatic living area, kitchen and dining room. The living area is centered around a large media center, and includes a built-in corner workspace. There is a generous deck off the living room suitable for entertaining outdoors. There are two large bedrooms, and two bathrooms. The master bedroom features tall ceilings with an abundance of natural light from high windows. The second bedroom, which can also serve as a flex space, has a partial wall to allow light to enter from the public area, making this an excellent place for a home office. The green features of this home include a high efficiency Lennox HVAC system, Energy Star appliances, bamboo floors, no and low VOC paints, dual glazed low-e windows, drought tolerant landscaping, and a rainwater catchment system. Pricing, terms, and availability are subject to change prior to sale. 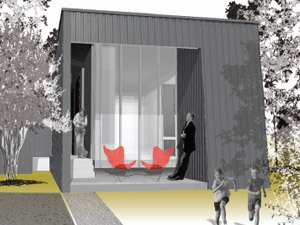 Rendering is artist’s conception. Owner reserves right to substitute building materials, finishes, or appliances and other features of the subject property and may alter plans and make other modifications as deemed necessary. All references to size, height and square footage are approximate. ©2007-2016 2736PartnersLLC. All Rights Reserved.